Actually two intertwined mysteries – why peaberry, a grade of coffee that is potentially available from any coffee growing region in the world, is so firmly associated with a single origin – Tanzania – that it is 1) usually the only coffee available from Tanzania in specialty stores, and 2) often the only pure peaberry available from any country in specialty stores. 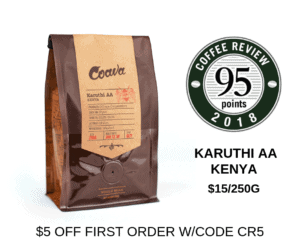 It also turned out to be the only coffee generally available in the United States from a whole swath of east-central African growing countries. For this month I had intended to do a review of Zambia and Tanzania coffees generally, perhaps with a Malawi or two thrown in (all distinctive and interesting African origins), but all that trickled in from the American coffee world were three Tanzania peaberries and a lone (conventional-beaned) Zambia. At any rate, what follows is a longish essay about peaberries and a short – very short – set of reviews of three rather nice Tanzanian peaberries from three excellent specialty roasters. Those readers who find their coffee sensibilities piqued by the reviews will find more to read about and sample in 2004. International aid money and development programs should make several of the new and interesting coffees from east-central Africa available in coming months, and I plan to try again for a comprehensive review of Zambias, Tanzanias, Malawis and Rwandas in 2004. Peaberries (also caracol or caracolillo, “little snail” in Spanish) result when the coffee fruit develops a single oval bean rather than the usual pair of flat-sided beans. A half-hearted, vestigial crevice meanders down one side of the little egg-shaped beans. Botanists observe that peaberries develop when only one of two ovaries in the flower are pollinated or accept pollination, thus producing one seed rather than two – an only child, as it were, in a species in which twins are the norm. Since Arabica coffee is self-pollinating (the same flower can impregnate itself) excessive peaberry production is a sign of general infertility of the plant. New hybrid varieties of Arabica that introduce genetic material from other species like robusta often produce large percentages of peaberry, for example, though that problem is usually corrected by backcrossing, or reintroducing Arabica material back into the partly sterile hybrid until it behaves normally and produces something close to the normal five percent of peaberry. At any rate, these little loner beans are either allowed to remain mixed in with the normal beans – the typical arrangement – or separated from the normal beans during grading by means of slotted screens, which allow only the peaberries to fall through. There are several sizes of slotted screen, so that coffee mills that are really into peaberries can separate out several grades of based on bean size. What readers impatient with detail should carry out of this paragraph is that peaberries are a grade (or a group of related grades) of coffee that a mill may or may not choose to create by a deliberate act of separation. You could create your own grade of peaberry simply by sitting at the kitchen table separating out the peaberries by hand from the normal beans contained in a pound of your favorite whole bean coffee – that is, unless the coffee mill did it already. The symbolic possibilities of the peaberry – singular versus double, round versus flat – has provoked a rich – and occasionally risqu&eacute; – mythology in growing countries. In particular, the peaberry is seen as male and often associated with virility. In terms of gender and anatomical analogy it seems to me that we could go either way on this one – either emphasize the shape (one half of a valued male appendage), in which case call the peaberries male, or focus on the crevice and go for female. Perhaps the mythology leans in the male direction owing to men’s oft-noted nostalgia for autonomy (one free bachelor bean) rather than relatedness (two matched and married beans). But, whatever the origin of the male symbolism, it ties in with another, perhaps slightly more valid mythology – the idea that peaberries produce better coffee than normal beans from the same crop. This contention often is supported by citing the idea that nature put all of the good stuff it normally puts into two beans into one. Of course, one could also argue the opposite – that peaberries are runt beans produced by half-fertile flowers, and so may be presumed to be weaker than their fat and mated colleagues. Based on my cupping, a consistent case can not be made for either alternative. My experience suggests that peaberries always produce a somewhat different cup from normal beans from the same crop (in other words, present a distinct variation on the same sensory theme), but not different in a consistent enough way to support broad generalizations about quality. More often than not peaberries produce a lighter-bodied, slightly more acidy, brighter cup than normal beans (apparently the case with these three Tanzanian peaberries), but I have also cupped peaberries that seem to produce a heavier bodied cup than their regular mates. Which gets us to the three Tanzanian peaberries sent to me by American roasters. For all I know, these peaberries all originated from the same exporter, perhaps from the same coffee mill. Certainly they produced a very similar cup. These are three interesting variations on a theme, with differences more defined by how the beans were roasted than by the flavor characteristics of the beans themselves. All three samples were light-to-medium in body, gently rather than searingly acidy, with a very clear, persistent chocolate-toned fruit. Those who enjoy a traditional bright breakfast cup with an acidy brightness and high-toned complexity will enjoy the medium-roasted Neighbors Coffee presentation, whereas those who like a darker-roasted, less acidy, more comfortable cup probably will appreciate the California Coffee Roasters or Humboldt Bay versions. Now back to the opening mystery – why do we get so many Tanzanian peaberries on specialty menus rather than Brazilian peaberries, or Ethiopian peaberries, or peaberries from any one of scores of other origins? Frankly, I don’t have a clue and neither does anyone else I have contacted. None of the statistics I have seen suggest that Tanzania produces any more peaberry than does any other coffee region. I would guess that at some early date in the development of specialty coffee the association of Tanzania and peaberry was established, and the combination remained standard in the specialty repertory ever since. Certainly the tradition of offering Tanzanian peaberry rather than some other coffee grade or type from Tanzania was well in place when I researched my first book on coffee in 1975. And, because specialty roasters reserve at most one slot for a Tanzania coffee, I suppose that over the years the peaberry option discouraged roasters from offering other Tanzanias. Readers who believe that they have some answers to the how and why Tanzania and peaberry became so closely linked are welcome to email me (editor@coffeereview.com), as are those who have additional convictions, sexual, gustatory or otherwise, about the mysterious peaberry. I will share the best contributions (though only the decorous ones). 2003 The Coffee Review. All rights reserved.